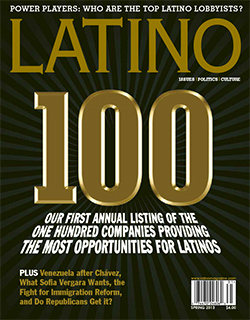 LATINO 100 is the first annual listing of the one hundred companies providng the most opportunities for Latinos. MINNEAPOLIS – April 17, 2014 – Cargill is featured among 100 U.S.-based companies for providing the most opportunities for Latinos in LATINO Magazine’s annual “LATINO 100” list. The list, which was compiled based on nominations by Latino nonprofits and community organizations, as well as LATINO readers, partners and stakeholders, provides a perspective on corporate support for the Latino community in areas of philanthropy, workforce diversity, minority business development and governance. Education remains one of the most important challenges facing Latino communities and companies including Cargill are featured in LATINO because of their strong support for encouraging Latinos to enter the STEM (science, technology, engineering and math) fields. LATINO Magazine is the flagship publication of the Latino Publishing Group based in Austin, Texas. View Cargill’s profile in the latest quarterly issue of the LATINO at http://latinomagazine.com/.